All quotations are subject to confirmation in writing by us on order from the buyer. The contract shall be concluded by the said confirmation and take effect from the time of despatch thereof to the buyer. The price of the goods is fixed only where we expressly state in this written acknowledgement that it will so be fixed and covers the period only stated also in this acknowledgement. In all cases, the prices are subject to variation and it is a condition of the acceptance of the order that the prices to be charged shall be that ruling on the date of despatch. Goods delivered from depot to be at depot prices plus haulage. Where quoted the price allows for delivery as near to the site as a safe hard road permits and unloading at ground level. The customer is responsible for providing all labour information and facilities necessary to effect and prompt delivery and unloading. If delivery or unloading is delayed by the customer default in performing his obligations set out in this clause we reserve the right to amend our price. We accept no responsibility for damage to manhole covers, gullies, culverts, bridges, stopcocks and the like whether visible or not, unless the attention of the driver was previously specially directed thereto and it was reasonably possible to avoid such damage. The customer will unload all goods immediately on receipt, otherwise waiting time will be charged for. Any damage caused on unloading will be the responsibility of the customer and no claims can be entertained in connection with this. The time of delivery is not guaranteed without previous special written undertakings. The copy(ies) of the delivery note must be signed on receipt of the goods. Unless any deficiency or damage is recorded thereon we cannot accept responsibility for claims. The buyer will be responsible for ascertaining and checking that the goods as ordered accepted and used are suitable for the purpose for which they are required. We give no warranties on these matters, and if any of the goods are found to be defective for whatsoever, we shall have no liability for any damage or loss of any kind, whether caused by negligence or otherwise or whether direct or consequential or occasioned thereby, apart from our liability below. Our liability is limited to replacement free of charge. We may at our opinion, make a fair cash allowance, the amount of which will not in any event exceed our invoice value for the goods. In accepting delivery of the goods supplied by us, the customer acknowledges that no representation whether oral or in writing has been made by us or by anyone in our employ which has led the customer to enter into the contract for the purchase of these goods. No representation or warranty is implied or given except as expressly stated in these conditions or in the appropriate quotation given in writing. When goods are offered and supplied to customers designs and specifications, no guarantee is given or implied of their suitability for the purpose for which they are used. All quotations ex stock are subject unsold on receipt of order. Clamps, Bolts, Dowels and other fixings are not provided for unless mentioned. Unless otherwise agreed we expect to receive full working drawings from which our shop drawing and fixing plans can be prepared. Slight variations in colour or texture such as in precast concrete products such as may be natural to the material cannot be excluded but we guarantee that such variations do not affect its soundness. In cases where a schedule of quantities is prepared by us on a basis for quotation, materials and labours will be charged for as eventually supplied, notwithstanding any errors or omissions in the schedule. If all the goods included in our estimate are not ordered we reserve the right to review our price. You have the right to cancel this contract within 14 days without giving any reason. The cancellation period will expire after 14 days from the day on which you acquire, or a third party other than the carrier and indicated by you acquires, physical possession of the last good. To exercise the right to cancel, you must inform us (Gate Auto, Unit 1, Valley Forge Business Park, Reedyford Road, Nelson. 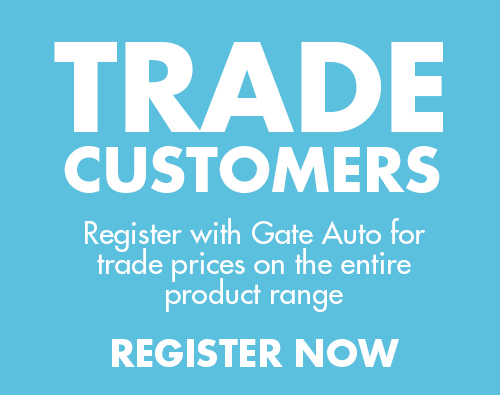 Lancashire BB98TU, sales@gateauto.co.uk, Phone number: 01282 677300) of your decision to cancel this contract by a clear statement (e.g. a letter sent by post, fax or e-mail). To meet the cancellation deadline, it is sufficient for you to send your communication concerning your exercise of the right to cancel before the cancellation period has expired. Items in the ‘clearance sale’ sections may potentially have slight variations or defects in the quality and future orders may potentially have differences that are out of our control as such do not constitute a breach in contract therefore we will not return the cost of your return but your cancellation & returns policy are mentioned above. We cannot accept responsibility for any damage or consequential loss arising from non-delivery or late delivery, or for delay or failure to complete the contract arising as the result of strikes, lockouts, labour disturbances, fire, frost, accidents, breakdown, acts of god, force majeure, or any cause whatsoever beyond our control. Where we have not agreed to credit facilities, payment is due as the order is accepted by us and must be made before despatch of the goods. Credit accounts are due for payment on or before the last day of the month following the date of delivery, when goods are invoiced or have been quoted subject to cash discount this will be allowed on payments made ON OR BEFORE DUE DATE ONLY, and will not be allowed on overdue accounts. In this event of non-payment on any account when due, the price of the goods already delivered shall immediately become due and payable without regard to credit terms previously agreed, and we reserve the right to stop any further deliveries and cancel any contract due any payable without notification for all or any part of deliveries not made, but without prejudice to our rights already accrued under any such contract. We reserve the right at any time and without explanation to withhold credit facilities from and to limit the amount or period of credit we will grant to any customer. Where goods are sold on a credit basis we reserve to impose a condition of sale that the minimum total charge for the goods on each invoice is £25.00, notwithstanding that the total of the goods sold amounts to less than £1.00. Expectance of the goods on a credit basis of the time of the transaction invokes this condition. The customer may conduct the contract on a cash sale basis, for the lower amount if acceptable, only at the time of transaction. Measurement and size or weight and the like stated on our quotation, or any list supplied by us or our manufacturers, are nominal in accordance with normal trade usage and customers must be prepared to accept variations due to the normal manufacturing processes and conditions. We do not accept responsibility for goods damaged in transit or for short delivery unless such damage or short delivery is signed for as such and is reported to the carrier and to us within 3 working days of receipt of the goods. We do not accept responsibility or liability for non-delivery or total loss unless such non-delivery or total loss is reported to the carrier and to ourselves within 10 days of the receipt of the invoice. Title in the goods does not pass to the customer until all the goods have been paid for in full. All outstanding invoices are payable on demand. No agent or representative of the company, other than a Director or Secretary has any authority to vary or omit these conditions or any terms. Any conditions of sale or purchase conflicting with these conditions shall not apply to the goods sold and these conditions shall prevail, and any qualification or instructions to this effect in the buyers order or otherwise shall be void and of no effect, unless we specifically approve in writing. Any acceptance by you of goods from us implies acceptance of these conditions. Our prices are subject to change without prior notice. 3.1 Copyright (c) North Valley Forge LTD.
8.2 You may cancel your account on our website using your account control panel on the website or by contacting us at sales@nvf.co.uk. 20.1 Our VAT number is 159227394. 21.1 This website is owned and operated by North Valley Forge LTD trading as Gate Auto. 21.2 We are registered in England and Wales under registration number 7577833 and our registered office is at North Valley Forge LTD, Unit 1, Valley Forge Business Park, Reedyford Road, Nelson BB9 8TU. 21.3 Our principal place of business is at North Valley Forge LTD, Unit 1, Valley Forge Business Park, Reedyford Road, Nelson BB9 8TU.